Summers are a time when people of all age groups require the most amount of liquids and energy to tackle the relentless heat. Food is one of the most basic requirements of every human being and living beings in general. People make a lot of different preparations in order to succeed in preparing tasty food. The cooktop is the most useful and essential element in a kitchen. People require cooktops to be clean and ready for use at all times. A kettle is a very old kitchen utensil that was usually used for making beverages like tea and coffee. However in the recent times its has proved to be a multi faceted item that can be used for various purposes. Tea time snacks are a must in every household, especially during holidays and weekends. These snacks are enjoyed by family members of all ages. In today’s world time is the most important resource. People have to do various jobs and fulfill various duties in their everyday life. 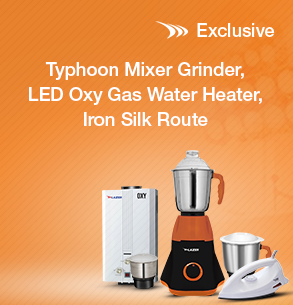 One of the first things that come to our minds when we talk of kitchen equipment is the mixer grinder. A ceiling fan is one of the most basic electrical appliances that we see in almost every house or any other place for that matter. Whether your loved ones love to take a shower or simply take a bath using the tap water, an ideal temperature is more than important. For all you know, choosing the appropriate ceiling fan for your house might prove to be a little more daunting than you thought. The reason being the numerous factors that need your consideration. How To Choose Water Pump For Home? Earth is composed of 70% water. However, out of this only around 2% water is potable and can be utilized by humans, flora, and fauna to sustain themselves. Regardless of what the weather is outside, and no matter how you’re feeling, somehow a sandwich can always make everything seem much better. That, however, depends on the taste of the sandwich. So, how can you ensure that this delectable delight blows your mind, every single time? The answer lies in a little secret called the art of sandwich making. After a torrid summer and a bashful rainy season, the much-awaited cool and breezy winter is finally here. Modernization is not just a term anymore, but a reality, especially when we talk about a typical Indian kitchen. Cabin fans have been around for quite some time now, and their popularity is only growing with each passing day. The festive season is here and kitchens all across the nations are buzzing with activity. There was a time India strived to become a Global Manufacturing Hub. Today, albeit gradually, this aspiration is turning into a delightful reality.